With environmental concerns for ports and bulk exporters becoming more strict, several companies are turning to a new technology to stop pollution during shiploading. Blue Water Misting (BWM) has developed a dust-suppression system that fits to the top of the vessel hatch and creates a barrier of fine mist that prevents escape of fugitive dust emissions. The system consists of a power pack that sits on the quay connected to the power and water of the port. These deliver a high pressure spray to an array of purpose-built spray bars that are temporally fitted to the hatch combing by the stevedores during loading. The BWM system creates a complete mist screen at the top of the hatch. By wetting airborne fines, the weight of each particle is increased. These heavier combined particles of dust and water fall out of the air back to the pile. BWM used science and its experience to create moisture ‘curtains’ in and around ship’s holds to make contact with the dust fines, increasing their mass and removing them from the air stream. The systems are deployed on several continents in Australia and Asia, but the most interesting systems are in Chile and South Africa. system in loading stopping dust escaping from ships’ holds. The benefit is huge saving in loss of valuable concentrate. Port Elizabeth is the start of the Garden Route in South Africa, a place of great unspoilt beauty with a thriving car export facility. Local mining company Tshipi wanted to export manganese fines, but the local authorities had concerns over the dust, particularly as the car loading facility was nearby. 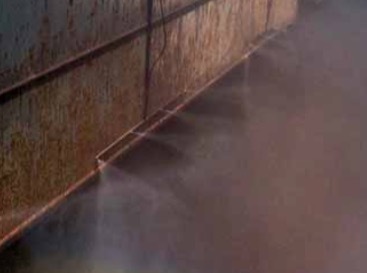 Using the innovative Blue Water Misting dust suppression system fitted to the hatch,Tshipi is able to prevent fugitive dust emissions during shiploading. This was a great win for industry — and the local community, providing a number of jobs — showing mining can be green.